AQUATREAT specializes in designing, manufacturing and commissioning commercial, industrial and municipal water purification systems in addition to wastewater recycling systems, pumping plants and other water and wastewater related custom engineered products. AQUATREAT has the capability to build complete treatment plants in addition to manufacturing of stainless steel and mild steel tanks, process equipment, pressure vessels, industrial filters and softeners, packaged sewage treatment plants, wastewater treatment equipment and containerized water treatment and desalination plants. AQUATREAT is a leading manufacturer of complete membrane systems providing consulting, design, engineering, market research, laboratory testing, pilot plant testing, and training for desalination plants. AQUATREAT is equipped with suitable machinery and tools capable of fabricating steel works of up to 3000 tons per year. In addition to manufacturing its own range of equipment and plants, AQUATREAT undertakes the assembly, packaging, installation and maintenance of its principal's equipment of which it represents. 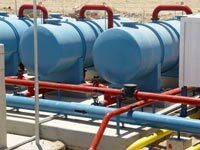 To complete its range of services AQUATREAT offers a comprehensive design, build and programming service for electrical, hydraulic and pneumatic control systems. AQUATREAT's in-house facilities include circuit design, panel building and simulation rigs. AQUATREAT has extensive experience of most industry standard PLC systems and control software. Our quality management and organization system has been certified by SGS according to EN ISO 9001. Equipment are manufactured under conformity with related EU mechanical and electrical directives and CE mark. AQUATREAT has developed, produced and installed high quality machines, components and plants for the use of water, wastewater, sludge and water intake works. AQUATREAT offers a wide range of custom made products and systems for municipal as well as trade and industrial applications. AQUATREAT's design and component selection takes into consideration present and future needs, normal and peak demands as well as space and location restrictions. The company’s activities range from skid mounted water and wastewater purification plants / products to multi-million gallon custom built plants. The effective, economic and reliable water and wastewater conditioning require the use of efficient and reliable machines and plants. The experience from the many installations with in-house designed and manufactured machines guarantees an extraordinary long-life cycle for them. The main advantage of the AQUATREAT's Mobile Containerized Reverse Osmosis Units is the ability to provide good drinking water to different number of people from any source that is not drinkable for various reasons. These reasons can be anything from bacterial contamination to high salinity. The design of AQUATREAT's mobile containerized units is flexible in the sense that it can handle and treat different sources of raw water with different characteristics. Depending on the type of raw water to be treated the recovery of the unit may decrease or increase. AQUATREAT's Mobile Containerized Reverse Osmosis Units are the perfect solution for providing potable water to isolated villages and population either due to geographical obstacles or areas of catastrophes caused by man or nature, for isolated and moving military units, mobile hospitals, coast guards, ships, humanitarian and refugee situations, and any other special applications. These units are either powered by diesel engine or petrol engine for areas where electricity supply is a problem. AQUATREAT’s Packaged Sewage Treatment Systems provide proven and effective wastewater treatment in a fraction of the space required for traditional field erected methods for natural sewage decomposition and treatment. AQUATREAT’s Prefabricated Packaged Sewage Plants are made of 6 millimeters thickness steel sheets. The tank is fabricated in steel plate adequately stiffened to prevent deflection, and is designed for placement on a flat concrete foundation. The plant can be easily moved and relocated. International standards were observed and considered in welding and fittings works and are compatible with humid climate conditions. Entire inside surfaces of equipment are completely sandblasted and then coated by 400 micron coal tar epoxy paint. Outside surfaces are also covered with coal tar epoxy paint with minimum thickness of 150 micron to provide smooth and clean surfaces. Suitable for applications in the domestic, municipal and industrial wastewater markets. Please visit our website www.aquatreat-meet.com for more on Plant and Systems.